Redfoo may be best known as one half of the duo LMFAO, but his music career started long before he began party-rocking with nephew Sky Blu. Born in Los Angeles, Stefan Kendal Gordy — the youngest son of Motown founder Berry Gordy, Jr. — started his career by working with rappers in the L.A. area in the late ’90s, including the Black Eyed Peas…. Redfoo may be best known as one half of the duo LMFAO, but his music career started long before he began party-rocking with nephew Sky Blu. Born in Los Angeles, Stefan Kendal Gordy — the youngest son of Motown founder Berry Gordy, Jr. — started his career by working with rappers in the L.A. area in the late ’90s, including the Black Eyed Peas. He featured on the appropriately titled “Duet” from BEP’s debut album, which would prove fortuitous almost half a decade later. In 2006, after forming LMFAO, Redfoo and Sky Blu were introduced to Jimmy Iovine at Interscope Records by head Pea will.i.am and were immediately signed. Their debut album, Party Rock, was released in 2009, and a year later they were featured on David Guetta’s remix of “Gettin’ Over You” with another Black Eyed Pea, Fergie. Buoyed by their growing popularity, they released their second album, Sorry for Party Rocking, which spawned a string of hit songs and high-profile tour slots. They even performed at the Super Bowl with Madonna. 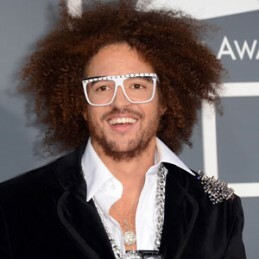 In 2012, the duo announced their hiatus and Redfoo released his first solo single, “Bring Out the Bottles.” He joined the judge’s table on the Australian X Factor series and went on to release a steady string of singles, including the Australian hit “Let’s Get Ridiculous.” The high-energy big-beat electro-pop songs continued to roll out through 2015, when he announced his first proper solo LP, Party Rock Mansion. Released in early 2016, Party Rock Mansion included first single “Lights Out,” a guest feature from Stevie Wonder on “Where the Sun Goes,” and “Juicy Wiggle,” which was included on the soundtrack to the Alvin & the Chipmunks movie Road Chip.